To log in to the NMS Match System, you will need to use the e-mail address and password that you previously established in the NMS Match System (e.g., when you registered your residency for the Match). If you are a new Program Director and do not have access to the login information created by the former Program Director, you must send a signed request to NMS, on residency letterhead, requesting that NMS update the account information for your residency. The letter can be sent by e-mail to dentres@natmatch.com or by fax to 844-977-0555. 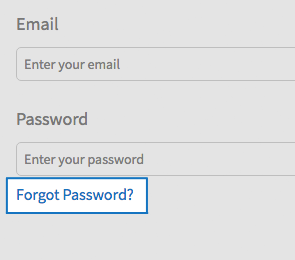 If you do not know your password, please use the Forgot Password? function available on the NMS Match System login page. If you cannot remember the answers to your security questions, please contact NMS for assistance. After you log in to the NMS Match System for a program, you are presented with a Dashboard. The Dashboard shows your program’s current participation status in the Match, the number of positions being offered, and information about the program’s rankings for the Match. The Status section shows the program's participation status in the Match. All registered programs that intend to offer positions that start training in 2019 should have a status of Active. If the program is no longer offering positions in 2019, it should withdraw from the Match. If you have withdrawn a program but now want that program to participate in the Match or offer positions in the Post-Match, you can reinstate that program before the Rank Order List deadline. You should ensure that the number of positions to be filled in the Match is correct for each program. The number of positions to be filled for a program can be changed, if necessary. Per the Residency Agreement, all positions to be filled in 2019 for the first year of training in a program must be offered through the Match; any exemption to offer a position prior to the Match requires written authorization from the appropriate sponsoring organization. The number of positions offered can be changed until the Rank Order List Deadline Date for your program. This section controls whether or not the program will be included on the List of Programs with Available Positions if the program has unfilled positions after the Match. Instructions for entering and certifying your rankings are available below. You may add new programs to your residency or change your e-mail, password and security questions in the Account section. Ensure your e-mail address is correct, as your residency's Match results and other correspondence pertaining to the Match will be sent to that e-mail address. If you are responsible for more than one program, any changes you make to your Account information will apply to all of your programs. Use the Add New Program button to add an additional program to your residency. All programs added for the residency must be the same type (e.g., OMS). To add a program of a different type, please contact NMS. To add a new program, select the number of positions to be filled in 2019 and edit the description of the new program. The description of the new program must be unique and clearly distinguish that program from any other program offered by your residency. The Program Code will be assigned automatically. The Profile information for your program includes the program description, residency name, Program Director name, mailing address, telephone and fax number. You may edit most of this information until the Rank Order List deadline for the program. However, you cannot change the residency's name or the program description once the NMS Match System is open for rankings. If your residency offers more than one program in the Match, you must enter and certify a separate Rank Order List for each program offered by your residency. Withdrawn applicants will be indicated with a Withdrawn flag when you search and add them to your Rank Order List. You are strongly encouraged to leave the withdrawn applicant ranked on the Rank Order List. Withdrawn applicants can reinstate themselves in the Match any time before the Rank Order List deadline. If you leave the withdrawn applicant on the Rank Order List and the applicant is reinstated before the deadline, that ranking will be used in the Match. If the applicant remains withdrawn, that ranking will not be used in the Match, and the Rank Order List will be processed as if you had not ranked the withdrawn applicant. Select the applicant from the search results. Press Add to List. Applicants should be entered in rank number sequence, with your most preferred applicant as rank 1, your next most preferred applicant as rank 2, and so on. You may add as many applicants as you wish. 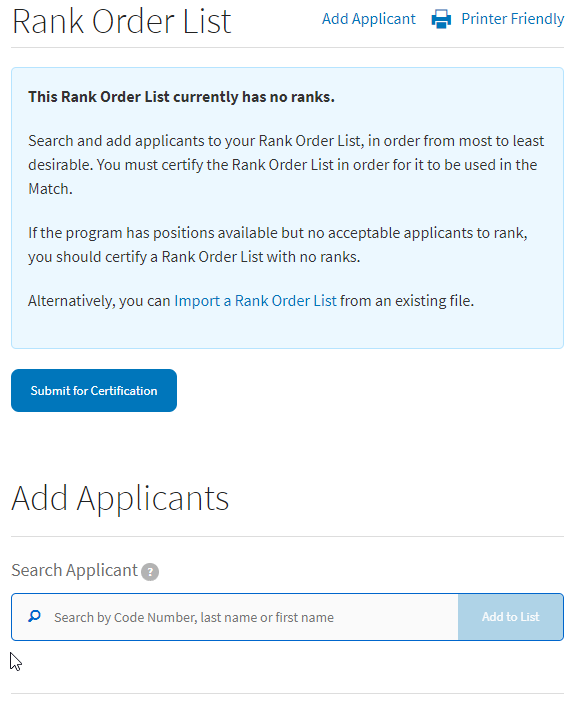 To import a Rank Order List into the NMS Match System, you need to generate a comma-separated text file (.csv) with the Match Code Numbers of the applicants to be ranked and then import that file into the NMS Match System. You will also be able to view and print your Rank Order List(s) until 4 days after the Match Results Release Date for each Phase of the Match. 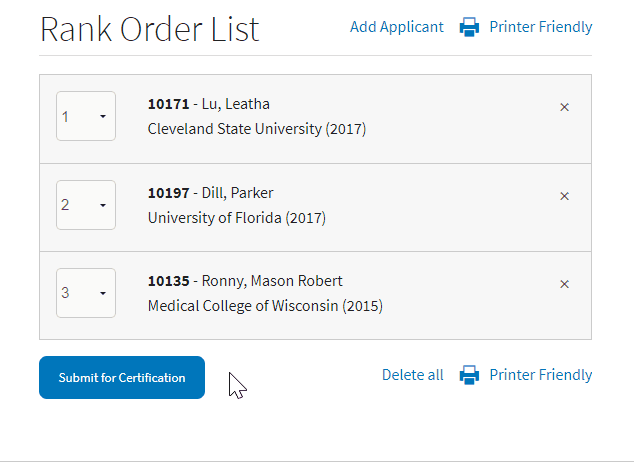 If the program has positions available that you would like to fill but you have no acceptable applicants to rank for the program, you should certify a Rank Order List with no ranks. 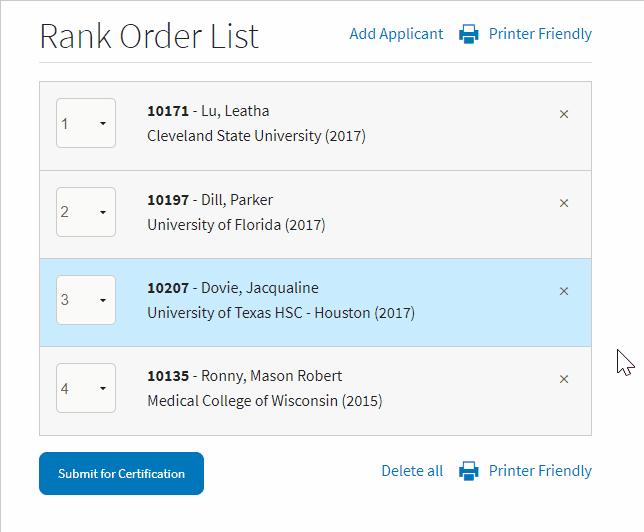 Reverting unfilled positions allows you to move one or more positions that remain unfilled from one Rank Order List to a second Rank Order List so that an attempt can be made to fill the available position(s) with applicant(s) on the second list. Certifying the Rank Order List tells NMS that the rankings are complete and the Rank Order List is ready to be used in the Match. You must certify the Rank Order List for it to be used in the Match. 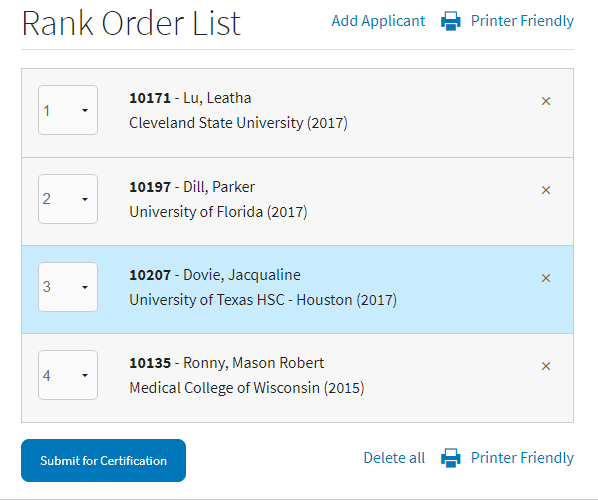 You can make changes to the list even after it is certified, until the Rank Order List deadline. If you make changes to a list after it is certified, the list will become uncertified and you will have to re-certify the list before the deadline for it to be used in the Match. You will not be able to certify your Rank Order List in the NMS Match System after the Rank Order List deadline for your residency. All Rank Order Lists must be certified by 11:59 p.m. ET on the Rank Order List deadline (November 16, 2018, for programs in Phase I of the Match and January 11, 2019, for programs in Phase II of the Match).